800-814-8321 Mon - Fri 7am - 5pm eastern time zone. 2019 - Delaware - State Only - ( Paper ) - ( Size - 18 x 24 ). Same Day Shipping - if paid with a Credit or Debit Card. Please Note: No Discounts are given on Paper / Non Laminated Posters with this extremely low price. We can offer you - Free Shipping on an Order of $100 or more. ( Free Shipping to 1 Location Only ). *** You must call 800-814-8321 to receive this offer. 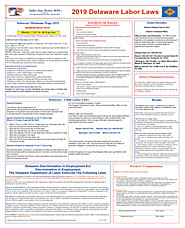 Copyright Labor Law Posters USA, Inc. All Rights Reserved. Build An Online Store with 3DCart.